Basically all i did was get two 1 inch hose clamps (maybe they were 1 1/4, I didn't really measure them), cut out a 3/4 inch section of the supply line, install the valve and tighten the clamps. I did let the engine sit a while, and cracked the system so it could release the pressure. The install truly took only 5 minutes. Easiest quickest most fulfilling modification I've ever done. I'll send a pic of the valve alone, and the valve installed. Feel free to post away. I can send pics of the electric valve and mounting solution when that gets done too. This should work for ALL LR's that share that heater core. Disco 1's, RR classics, and defenders. Well, I went and bought one today for my wife's LWB. $83 bucks and it does the same thing as the $11 manual valve I have on my SWB. I took a picture of it next to a ruler if anyone wants to see how large it is. It is bigger than I thought it would be (and a tad more expensive than I thought it would be honestly), but will fit where I put the manual valve on my other truck. 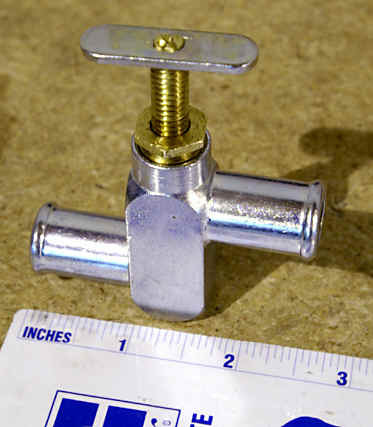 The inlet/outlet pipes are 3/4 of an inch across, and with the 'bump' that the hose has to go over is nearly 7/8ths of an inch. This might require a step up/step down adapter. We'll see. Wiring is good quality, connectors are gasketed very well, and the switch looks nice with a decent cover plate and knob (I lost the damn knob not 10 minutes after I bought the valve!!!). Hopefully I can get it installed this week. I got the A/C system up and going now, and the finishing touch would be to eliminate the hot water going into the heater core! see page 7 for what appears to be the manual valve in Michael's picture.